1. Da who is this Cabinet Secretary running for an elective post in May 2010, who is rarely in his government agency these days? He claims that he is doing his campaigning on "my own time", and says the agency is not spending its funds for his visits to his home province. Hay naku, sino naman ang niloloko mo ateh? In fact, it's Friday today, still a working day, and he is already there in the province, accompanied by another govt official handling a major agency. Oh, and we are no longer surprised why he looks well-dressed all the time. 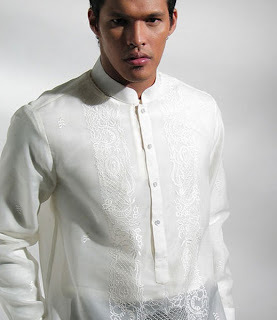 Apparently his barongs are supplied free of charge by another govt agency. Employees of that agency mutter that they hardly have a decent budget to run their projects, and here they go having to finance the Cabinet Secretary's clothing needs. Yes, fellow taxpayers...we're paying for this guys' threads. As if he can't afford to buy his own clothes. Kakahiya! Tsk, tsk, tsk. Clue: the Cabinet Secretary's home province is synonymous to kisses. 2. DA who is the head of this newly-formed regulatory agency who is said to have hired as many as 100 consultants, some of whom are even husbands and wives? Businessmen who have to deal w/ this agency complain that there's even more corruption there than in the previous agency it had superseded. Its inspectors, for instance, who are tasked to oversee the safety of the equipment falling under the agency's purview don't even have the skills to check said equipment's standards. So those new businessmen who want to have their equipment checked and are not aware of this, can just pay off the inpspectors to give them a passing mark. And bec. licenses and safety permits are given annually, can you just imagine the humongous amounts of money coursing through that agency under the table?!?! Clue: The head of the agency is said to be the alaga of an ageing senator, and also of a military persuasion. 3. As early as 2005, the presidentita and the head of her transportation agency was already told of the need for Caticlan's runway to be extended by at least 200 meters more. The presidentita said, however, Boracay was already "overcrowded" and overrun by resorts. What she failed to realize however, is that Boracay is the only island saving the tourism industry of the country as even during times of economic downturns, Pinoys who can no longer afford to go on vacations abroad just go to Boracay. Because of the shortness of the runway, however, two planes of Zest Airways were involved in crashes in January and in June this year, leading to temporary closure of the airport. (Of course, it's also due to the fact that Zest Air's Chinese-made MA60 planes aren't exactly made for short takeoffs and landings.) This led to the govt deciding to only allow Seair and lately, PAL Express to use the Caticlan runway. All other airlines have to land and takeoff in Kalibo. Consequently, most resorts and restaurants on the island have complained of a 20% drop in business, as tourists don't want to pay a premium for the convenience of landing in Caticlan, just 15 mins away from the island resort, compared to Kalibo, which is an hour and a half away. Although the airport has been privatized and supposed to be developed by a group led by George Yang of McDonalds Phils. (Golden Arches), on our recent visit to Boracay, we didn't see any construction activity ongoing at the terminal nor the runway at all. With the recession still ongoing, and tourists not wanting to shell out more money to pay to land in Caticlan, we doubt that it would be a Merry Christmas for Boracaynons this year.